Reserve Bear Footin In The Smokies Today! We enjoyed our stay at bear footin in the smokies. It has everything you need to enjoy the perfect mountain getaway. We stayed here for our honeymoon! It was a great cabin and felt so much like “home”. It was refreshing after a 9 hour drive! The week went by way to fast! It was in between pigeon forge and gaitlinburg. We were always finding something to do including watching the hallmark channel one night by the fireplace. We will be back with our family! It is very roomy for many people! Thank you! Our cabin was perfect from the bear decor throughout which provided a comfortable feel to the log style beds in each room . The cabin is set in the mountains with breathtaking views. The kitchen has everything you need if you decide to stay in and prepare a meal . The jacuzzi bath tub is perfect to soak in after coming in from site seeing and shopping . The hot tub is located outside on a beautiful porch that overlooks the woods , it is very peaceful and so relaxing. The cabin has a warm and inviting feel to it every room is perfectly decorated and all of the furniture is a perfect addition to this cozy place. The ceilings are high and provide just the right amount of sunlight. 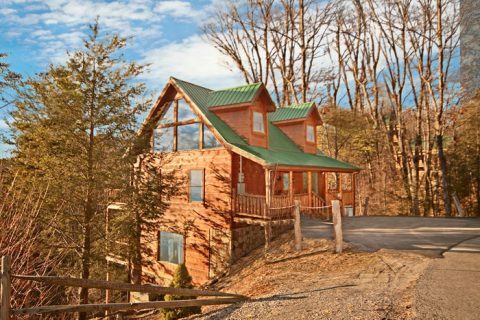 Bear Footin in the smokies has everything you need for a perfect get away . Cabins USA was very easy to deal with the entire process was quick and convenient. We opted for express check in which provided us the opportunity to pay our balance and receive our check in details in our email so we could drive straight to our cabin . Cabins USA has the best selection of cabins and we absolutely adored our cabin it was everything we dreamed of and more the pictures did not do this place justice. We can't wait to come back ! Cabin was dirty and didn’t look like the pictures online. What a fantastic cabin! Our group of 7 had a wonderful time staying for 5 days. The kids loved the pool table and foosball table. Not sure about the taxidermied bear display in the living room - this was not in the pictures. It took up a lot of space in such a small room - and due to the reflectivity of the glass it was pretty hard to see much of it. Also my wife was disappointed that the phone booth was locked - she wanted to get pics of the kids in it, Other than that the place is fantastic! Word of warning, do not use your GPS to get to this cabin, it will send you far away to the top of some other mountain!! We loved our cabin and location! It was very clean and we appreciate a clean place to stay when we are away from home. We always loved the decor, the owners did a fabulous job and thank you for still having it decorated for Christmas. Nice cabin. Lacking a table to eat at. Also struggled because of the weather and the mountain... had no one salting the mountain so it was quiet a trip up it. Other than that enjoyed our stay. The cabin was very clean and in a great location! We will definitely book another cabin with Cabins USA in the future! Cabin was cozy and inviting. I’m sure we’ll visit again. We did enjoy our stay but there were a few disappointing things . One was the back decks , they were both pretty dirty , full of leaves and cobwebs and spiders. It was very obvious they haven't been cleaned in awhile , was looking forward to sitting out there in the mornings to drink my coffee and evenings with a glass of wine but couldn't do that . The hot tub had a very strange odor so didn't really enjoy that . Also the living room furniture was not very comfoetable . Other than those few things it was a good place . Our 2 granddaughters had the upstairs to themselves and they just loved it . The bed was very comfy and we loved the bear decorations . Overall it was a good place to stay . I am so happy to hear that you enjoyed your stay in Bear Footin in the Smokies! Thank you for choosing Cabins USA and we look forward to seeing you again soon! towels, and in the bath tub. There was animal poop (I'm assuming small dog) on the lower deck right corner... and a lot of it. added up. Other than that, we had a wonderful time and its a wonderful place to stay! Bear Footin in the Smokies was a very nice cabin. It was a great location and close to downtown. The beds were very comfortable and the place was very well decorated. I would definitely use Cabins USA again and would recommend to friends/family. Thank you for taking the time to let us know about your recent stay in Bear Footin in the Smokies! We here at Cabins USA work hard to make sure each of our guests have the same great stay you enjoyed while vacationing in the Smokies. When you are ready to stay with us again, please mention you are a return guest for an additional discount. Thank you again for your review and we look forward to seeing you again soon! We enjoyed our cabin very much. A couple suggestions that would make the cabin super awesome is a TV that you can see from the hot tub (the boys like to watch their sports), the TV upstairs mounted, its kinda hard to see when laying down and maybe adding a bathroom on the lower level since a lot of time was spent down there with all the fun activities. Absolutely none of the suggestions are deal breakers because this cabin was super awesome. We definitely plan on returning. Thank you for the hospitality! Thank you for all of your kind words and suggestions! We here at Cabins USA work hard to make sure each of our guests have the same great stay you enjoyed while vacationing in the Smokies. When you are ready to stay with us again, please mention you are a return guest for an additional discount. Thank you again for your review and we look forward to seeing you again soon! The hot tub could have been cleaner but over all it was a great cabin. I would stay there again. Thank you for taking the time to let us know about your recent stay in Bear Footin in the Smokies! We here at Cabins USA work hard to make sure each of our guests have the same great stay you enjoyed while vacationing in the Smokies. Thank you for letting us know about the cleanliness of the hot tub. Your comments have been forwarded to our housekeeping supervisor to be addressed. When you are ready to stay with us again, please mention you are a return guest for an additional discount. Thank you again for your review and thank you for choosing Cabins USA! Perfect cabin. Excellent company for reservations and ease of checkin. My only suggestion is to hang or place something up around the hot tub on the lower deck. The cabin or rental next door is in clear view. However this cabin is gorgeous. The beds are so comfortable. We were pleasantly surprised at how tidy and well kept was the cabin. It was perfectly located in between Gatlinburg and Pigeon Forge with relative ease to access. We would highly recommend it to others and infact, have already done so! The advance speed check in with cabins usa was seemless and incredibly convenient. My only complaint is the hot tub that we were looking forward to using did not work the entire time we were there. We called to report it on a Saturday and the guy came to fix it as we were leaving. So that was a major disappointment. But otherwise, we loved it. Thank you for taking the time to letting us know about your recent stay in Bear Footin in the Smokies! We here at Cabins USA work hard to make sure each of our guests have the best stay possible while vacationing in the Smokies. I apologize you were unable to utilize the hot tub during your stay, but that issue has been corrected. When you are ready to stay with us again, please mention you are a return guest for an additional discount. Thank you again for your review and thank you for choosing Cabins USA! Our family absolutely loved this cabin! We will definitely book this cabin again in the future! Plenty of entertainment for everyone in the family. We expected a view of the mountains but the location only had a view of the trees around it & the sky. Although, the view wasn't what we hoped for, the cabin overall was amazing!! The only issue we had during our stay was that we set off the alarm when we arrived. Large cabin. Comfortable beds. All amenities worked. Quiet area away from other cabins. Beautifully decorated and functional. Would have liked a dining room table and chairs. Only downside was that the parking area was extremely small making it difficult to park the two large vehicles we had. The cabin was convenient to both Gatlinburg and Pigeon Forge. The cabin was very clean and the beds were comfortable. Those were my two biggest worries, but both were excellent. The only issues we had was the Wifi didn't work (when we told the office they just said thanks for letting us know) and there isn't enough seating on the main floor. The cabin is for 8, but only has enough seating for 4 and no table anywhere to eat. So some of us had to sit on the floor to eat or play cards on the small coffee table. There were tv stands provided but all were broken. There was more seating on the bottom floor, but we all wanted to sit together to eat. Overall we were very pleased with the cabin and would recommend to friends and family. Thank you for taking the time to let us know about your recent stay in Bear Footin in the Smokies. We here at Cabins USA work hard to make sure that each of our guests have the same great stay you enjoyed while vacationing in the Smokies. I apologize the internet was not working properly during your stay. Maintenance has been notified and correct the issue. When you are ready to stay with us again, please let our reservationists know you are a return guest for an additional discount. Thank you again for your review and thank you for choosing Cabins USA! It stated it was a private cabin,but there were neighbors..and it had that it was a mountain view but wasnt...but cabin overall was very nice..we enjoyed our stay and would stay again.. The cabin was beautiful and nice location. We enjoyed our vacation so much. Only thing we didn't like was the grill on the property, it was leaning down hill and wasn't easy to use. And if you stay in this cabin please be advised that the next door neighbors and their visitors park at this cabin often because they don't have enough parking space of their own, and this cabin has limited parking of its own. Thank you for taking the time to let us know about your recent stay in Bear Footin in the Smokies! I apologize for the issues with the grill. Maintenance has been notified and will correct that issue. When you are ready to stay with us again, please let our reservationists know that you are a return guest for an additional discount. Thank you again for your review and we look forward to having you as our guest again! We loved the cabin and our stay there. Something we didn't like was that it was advertised as secluded yet there was another cabin right next door that was level with the lower deck and jacuzzi. The directions to the cabin were easy to follow and we will stay again, however, the description of the cabin needs to be updated as there is nothing secluded about it. Cabin was great. We have three kids and they loved everything about it. I would highly recommend it and would stay again. I am happy to hear that you and your kids enjoyed their stay at Bear Footin in the Smokies. No matter what you're looking for in a cabin, our reservationists are always more than happy to help you find the perfect cabin. Thank you again for choosing Cabins USA and we look forward to having you as our guest again! Jeff and I started renting at Cabins USA back in 2010. We've stayed multiple times since then, including our honeymoon, and never once have we had a "bad" cabin. Everything is always clean, comfortable and just far enough out to give us peace and yet be close to sights and activities. We always use Cabins USA when we come to the mountains and every time, including Bear Footin in the Smokies, we've loved our accommodations. I refer people all the time! I'm sure we'll see ya'll again soon! Thank you for always choosing Cabins USA when you visit the Pigeon Forge and Gatlinburg area! The best compliment we can receive is when our guests recommend us to their family and friends. No matter what you're planning on doing or what area you would like to stay, we will have the perfect cabin for your vacation. Thank you so much for your kind review and we look forward to having you as our guest again! This is our second time staying at this cabin. We absolutely love it. The cabin is decorated beautiful and the beds are soooo comfortable. Everything is always very clean. The kitchen is equipped with just about everything you need to stay in and cook. The area is very quiet and relaxing. After a day of hiking and exploring we look forward to coming back to this amazing cabin and relaxing. Thank you for another amazing time. We really enjoyed our stay. Cabin was really nice and in a perfect spot. Hope to return soon. Cabin is in need of some TLC. The hot tub and grill were not in working order when we arrived. The pool table only had one functioning pool stick. We did appreciate the maintenance crew coming out quickly and fixing what they could. It was a beautiful cabin and we had a great stay. Bear Footin' in the Smokies is a great cabin. It was nicely decorated and very clean. It's location was up the mountain off of the parkway. It was a bit challenging navigating the road at night, but not a show stopper. We really enjoyed the cabin and had a great stay. I would recommend this cabin to others. It is a great value and very roomy. We didn't realize that the upper bedroom was actually a loft until we arrived. Otherwise we probably would have chosen a different cabin because we were two couples who preferred private rooms. But the loft worked fine since it had its own private bathroom. There is a game room in the basement that was great for evening fun. The cabin is well equipped with just about everything you need for comfort. We had a great time. Thank you for your review. We are delighted that you enjoyed your stay with us at Bear Footin in the The Smokies. We apologize for any inconvenience you encountered during your stay, and we appreciate your feedback. We hope that we will hear from you again soon. Do not forget about our return guest discount. The cabin is beautiful and peaceful. It provided a wonderful getaway for us. The only things I would like to see different are the cleanliness of the provided cups & dishes....we had mold in all the coffee cups and had to clean them with bleach before use, and the pool sticks could definitely have been in better shape. Only one had an end on it & it didn't want to stay on. Never rented a cabin before. We loved this cabin it was so roomy and comfy. Never want to stay at motel again. Priced well and had everything we needed. I loved this cabin & I look forward to staying with you all again. The staff was super friendly! Thanks! Very pleased with this cabin. The kitchen was very well stocked, coffee & sweetener provided, and tv trays were on hand. I have small children and it was very nice that there were several nightlights. Parking was a little tight for two vehicles (small sedan & small SUV) but we were careful and it worked out fine. I was pleased with the location since we wanted to do things in pigeon forge and Gatlinburg. The road leading to the cabin is narrow and curvy but was not an issue. There were other neighboring cabins that were occupied but I never heard any noise. Again, this cabin is not on the "strip" but that was exactly what I wanted. The only complaint I had was long "hold time" while calling cabins USA but it was a busy time and all my questions were answered and everyone was friendly. Extremely happy with this cabin and extra touches made to make visitors more comfortable. I did tons of research before booking since I have an infant, toddler, and a disabled parent and I knew we needed a few things people normally wouldn't be looked for and this cabin was perfect for us. Loved the cabin. Very clean and had plenty of room. Game room was great. Would be nice to have some type of dining table inside even if in the game room. Still a great place to stay, and we would stay there again. Problem with big screen TV.j Cd player did not work in stereo system, Otherwise very nice! Thank you for your review. We apologize if you were inconvenienced regarding the issues you experienced. We have had a new TV ordered and will be at the cabin soon. We are glad that you did enjoy your stay at the cabin and we hope to hear from you again soon. This was one of the best cabin rental experiences we have ever had! Loved the beds and the decor. Would highly recommend this cabin to anyone! We loved our stay at Bear Footin'! The cabin was decorated so cute and everything was very clean. We loved the location, too! Away from it all, but right in the middle of everything. My husband and daughter had a great time playing pool every evening. And my daughter LOVED the "outhouse" closet in main level bedroom! We look forward to staying here again!!!! I vacation in Pigeon Forge at least twice a year and Always use Cabins USA. The staff are beyond friendly and helpful and my two boys and I have Never been disappointed with our stay!!! We had a great time in this cabin. We started saving while the so we can get the same cabin again next year. We loved everything about our stay there. The cabin was very clean an made u feel right at home. We will most defiantly tell everyone to use your cabins! We will me back in a year! Thank you cabin usa we love your cabins! The only complaint we had was the seating in the living room was not very comfotable, expecially the lounge chair. We did have a black bear and racoons get in our garbage and we got some great video of the bear. The parking was a little tight for a full size truck but we managed.We think the bathroom off the master bedroom needs more towells and wash clothes, but thats the only complaints we had. The area is gorgeous and we will go back again. Thank you for choosing Cabins USA. We are happy that you enjoyed your stay with us at Bear Footin in The Smokies. We apologize about the inconveniences you experienced during your stay. We look forward to seeing you on your next trip to our area. We enjoyed our stay at "Bear Footin in the Smokies". It was nicely decorated for the holidays and was very cozy. We really enjoyed the pool table and the hot tub. Our only complaints was the hundreds of lady bugs inside the cabin. The upstairs bedroom was the worst place for the ladybugs. Also the ceiling leaked from upstairs to the main bedroom downstairs and so when someone would shower upstairs, someone would get wet in the downstairs bedroom. Otherwise, we had a great stay!!! This was a wonderful Cabin and in a great central location without huge hills. It was good to just relax! Thank you for choosing Cabins USA Gatlinburg. We are so pleased to see that you enjoyed your stay in Bear Footin in the Smokies. Thank you for the perfect rating score. We hope that you will stay with us again soon. Will definitely be returning next year! Exceeded every expectation that we had. The cabin was very clean and cozy. Not one REAL complaint can be made about this location. Yes, there are bugs...outside, go to a hotel if youre going to be that picky. LOVED this place! Thank you for choosing Cabins USA Gatlinburg. We are happy to see that you had such a great time at Bear Footin in the Smokies. We hope to see you again soon. Really enjoyed the stay. Cant wait to go back. The Cabin was beautiful and was minutes from all the amenities. The cabin was very spacious for the six of us and the kids had a great time playing pool and roasting marsmellows, The decor was full of bears and had a country home feeling the perfect get away from the city life. The only thing I would suggest is that the sofa beds be replaced, they were very worn . Also the BBQ gas grill was on its last leg. But overall I would reccomend this cabin. My family loved the cabin. Had an awesome time. Can't wait to go back! Thank You for the memories.